All of us use Gmail. It has become an integral part of our web life. Most of us also use Gmail as our corporate email using the Google Apps for Business. I personally use 6 different Gmail accounts. With so much dependency in Gmail, it is only natural that we have a tab for Gmail always opened in our browsers. 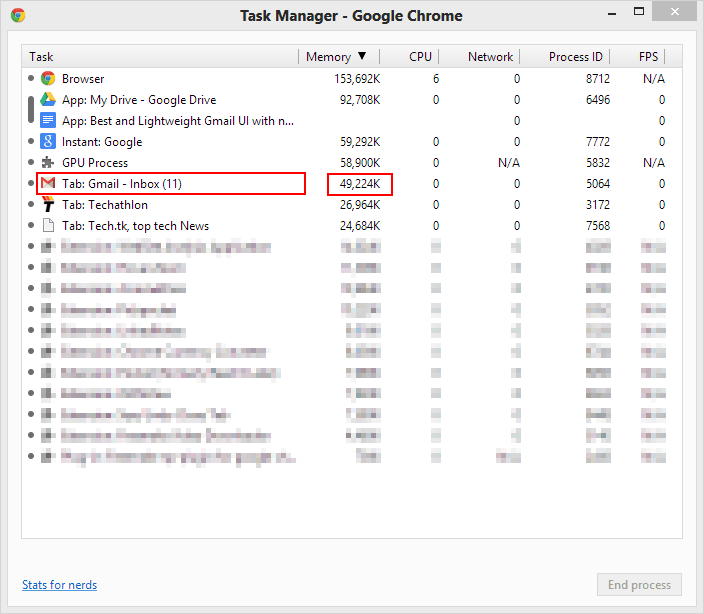 But have you ever noticed the amount of memory that single Gmail tab takes? Well here is what happens to my Gmail tab. It is around 243 MB for that single Gmail account. 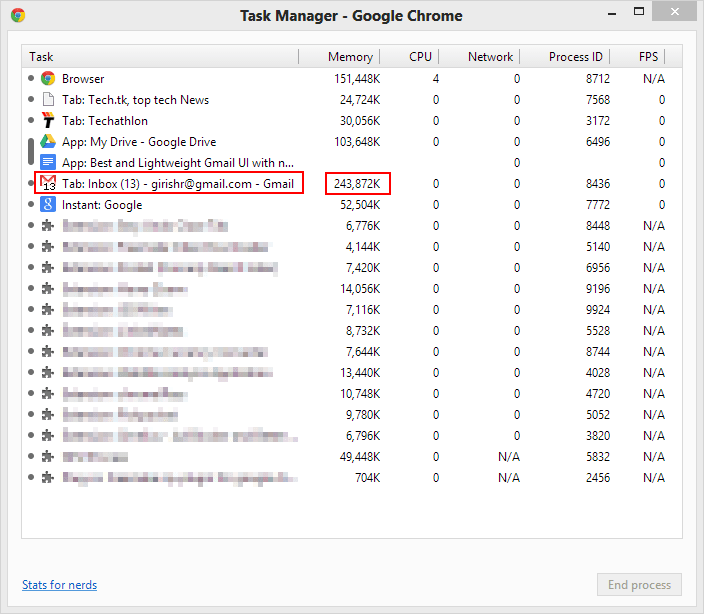 And with each account additional Gmail tab a similar amount of memory get used up. There are times when my whole system become slow with these multiple Gmail accounts running in the background. Gmail Offline is a clean and ad free solution to this problem. Gmail offline is a Google product that is intended as a Google chrome app, which is actually a hosted application on the Google servers. So once you get hold of the URL you can run this version of Gmail on any browser. 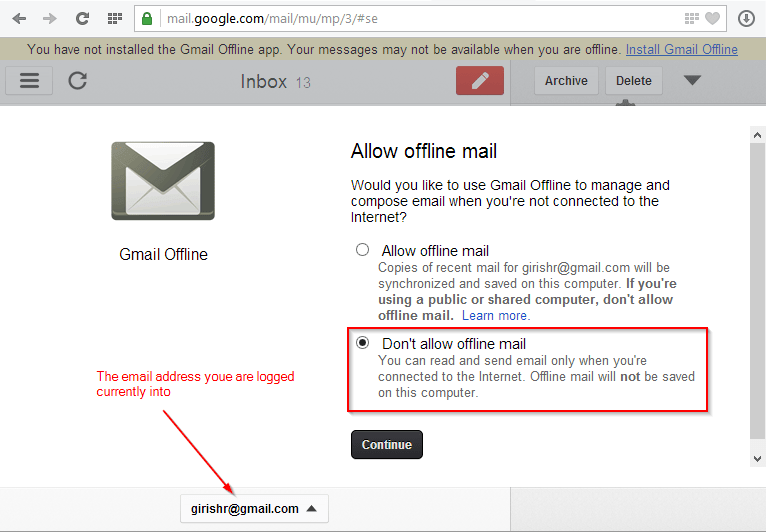 To access Gmail Offline navigate to the URL https://mail.google.com/mail/mu/?mui=ca . You will be redirected to a login page if you are not yet logged into any Google account, which is very unlikely. Log in and you will be prompted with an “Allow offline mail” message. Select the “Don’t allow offline mail” option and click Continue. Once done you will be presented with the vertically split Gmail Offline interface which is clean, unobstructed and ad free. You can notice how the UI occupies the entire browser screen with only the information relevant to your emails. One of the greatest advantages is the low memory usage. For me, it’s around 50 MB. 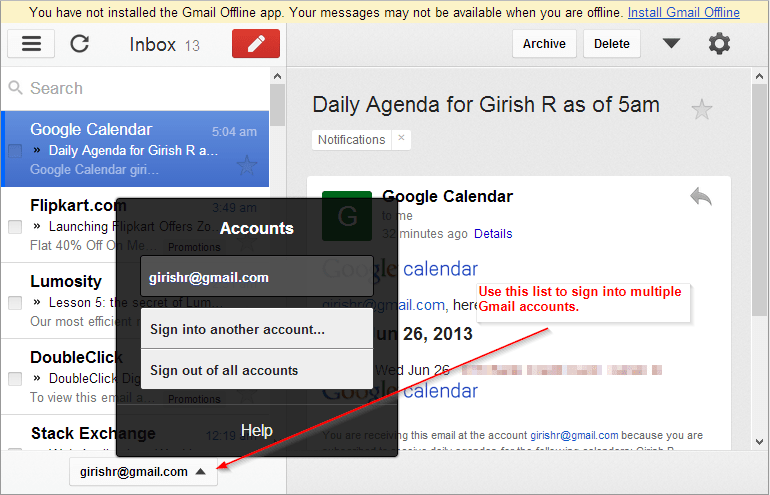 Switching Gmail accounts is also very easy and is switched within the existing UI without opening a new tab. If you have ever used the Gmail app on an iPad you will be surprised to see the eerie similarity with the Gmail Offline UI. Currently Gmail Offline does not work smoothly with IE.